After prepping and beginning to push the Android 4.4 “Kit Kat” update to the DROID MAXX and ULTRA back in mid-December, word spread of a group of devices potentially being bricked and needing revival support from Motorola. All signs pointed towards the update being pulled while Motorola looked into the situation, though no official word ever confirmed that. As of this morning, we are starting to hear from readers who have received the same update (build 19.5.3), which could mean that Moto has worked out all of the kinks. 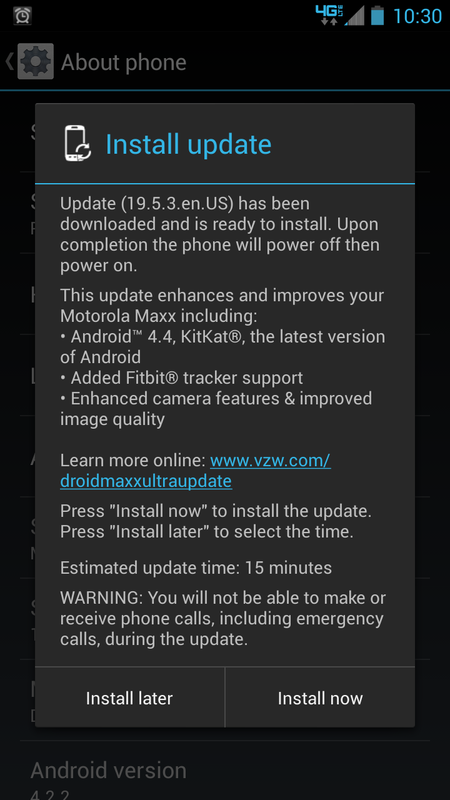 To see many of the new features you’ll receive with Kit Kat, be sure to check out this platform highlight post. We also went hands-on with Kit Kat for the Moto X, which should give you a great look at what Kit Kat will bring to the MAXX and ULTRA. After all, these three devices are almost identical outside of their appearance. Since we don’t have an ULTRA or MAXX in house, this is where we ask you, dear reader. If you have not yet installed the Kit Kat update on your new DROID device, are you seeing an update when heading into Settings>About phone>Software update?